One of my favourite past times back in the day, and even now, is to thumb through cookery books. I make elaborate mental plans to make such and such but the reality is crushing, I barely have time to get dinner on the table let alone work my way through a baking bucket list. Nevertheless, I have one, and one day I will start ticking it off. One cake that always caught my eye, especially when I used to day dream with my mothers cookery books, was a Savarin. It always looked so elegant and sophisticated; so impressive that I made a mental note. So, when the challenge for the Daring Bakers this month happened to be a Savarin, my bucket list blinkers went on alert. Here was my chance to finally tick one off! My Orange Savarin did a bit of a double duty; not only did it satisfy the Daring Bakers’ Challenge, it also served as a beautiful birthday cake for my husband, Trace. His birthday was yesterday and we thoroughly enjoyed the cake. The Savarin is a yeasted cake that is drenched in a honey/sugar syrup, usually spiked with rum, and filled with cream and fruit. 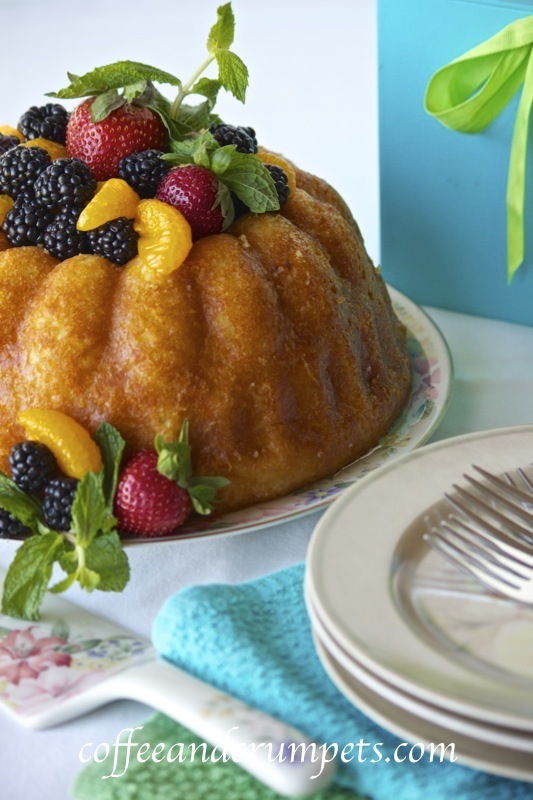 The Savarin is made in a Savarin mould which is similar to a bundt or ring pan. I just used a bundt cake pan for my Savarin and left out the alcohol. There are “economical” versions where the sugar syrup is flavoured with honey or fruit juice. I decided on an orange flavour for my cake and it came out really well. I chose not to fill mine with cream but served it along side. If you were serving this for a dinner party where the chances of it being completely consumed are quite high, I would fill it and pile on the fruit. For us, it seemed silly to fill and then have the left overs sit over night in cream and fruit. Filled or unfilled, it is a delicious cake and the smell while it bakes will drive you insane! The soaking syrup keeps it very moist and the fruit and cream keep it from being too sickly sweet. It is a great dinner party dessert and guaranteed to impress. Wonderful thing is that it is ridiculously easy to make. Adapted from "The Complete Book of Home Baking" by Mary Norwak. assorted fruit and berries: I used blackberries, strawberries and mandarin oranges. In a large bowl, mix together flour, yeast and warm milk and put aside until nice and frothy, about 20 to 30 minutes. Grease a Savarin mould or a 9" (23 cm) Bundt cake pan. I used a non stick spray, it greases more evenly. After the yeast mixture is frothy, add all the cake ingredients and beat thoroughly for about 4 minutes. Fill the mould with the batter, it should come up half way. Leave to rise until doubled in size, covering with cling wrap. It should come up to the top of the pan, about 40-60 minutes. Once the cake batter has risen, place in the oven. Bake until deep golden brown, about 20-25 minutes. Once baked, let cool in pan for 5 minutes and then turn out on to a wire rack and cool completely. Place the cake on a large plate. Using a skewer, poke holes all over the Savarin so that the syrup will soak into the cake. To prepare the syrup, zest the oranges by using a peeler to peel large strips of the zest. Juice the oranges after zesting. Place the sugar, water, zest strips and orange juice in a pan and bring to boil on low heat. When the sugar is dissolved and the mixture comes to a boil, boil for 1 minute and pull off the heat. Keep aside ½ cup syrup to mix with the fruit. Pour the hot syrup over the cake a little at a time. This will take time, the cake will soak in the syrup but you will have to keep spooning and pouring and re-pouring the syrup until almost all is soaked through. Once the cake is soaked with the syrup, you can fill the centre with cream and decorate with fruit (mix with reserved syrup, if desired), or serve on the side like I did. Make sure your serving plate is large enough to hold excess syrup! The syrup soaking part takes a few minutes. The cake is slow to absorb but it will take almost all the syrup. I have suggested a few different fillings, you can use pastry cream, or Chantilly cream or caramel frosting and so on. I just used plain sweetened cream. The choice of fruit is open too. I usually like berries with my cake and I added some mandarin oranges too, worked out really well. The variations of this cake are endless and you can pretty much do anything you want. The fillings and fruit are open to seasons or occasions. This is an easy cake to make and like I mentioned above, a great dinner party dessert. I need a few pieces to go! That looks incredible with a pile of fresh fruits on the top! Thanks Kiran! Thank you for stopping by and leaving a comment. I appreciate it! Could you please parcel me a piece?? Just one? Pretty please. I am drooling so bad that my keyboard is threatening to quit. Sure Minnie! I can’t guarantee how fresh it will be once it gets there though! Thanks Charlie. It did look bey beautiful and my hubby was happy to have a pretty cake. The syrup definitely keeps it very moist. What a lovely cake. I have a savarin pan but have never used it…you have given me inspiration. Great pictures, and such a wonderful recipe! I’ve not made a savarin, and it’s really something I should try (or more like, talk my wife into trying – she’s really the baker in our household). Excellent stuff – thanks so much. Thanks John! I hope she does have a go at making it, it’s fairly easy and so good! Now this is a birthday cake! It really is fantastic, Nazneen, and your photos beautiful. I bet your Husband was thrilled to receive it. Looks an absolute delight Nazneen. I wish it was my birthday cake. David Crichton recently posted..Tea Smoked Duck, Caramelised Pears and Tomato Jam. What a beautiful recipe, Nazneen! I am constantly in awe of your breathtaking photos – I must sound like a parrot now! Absolutely gorgeous, Nazneen. Love the scrumptious photos. Hope you are having a fabulous weekend. Thanks Lail! Alham. It’s a good weekend, our weather is finally nice! This cake looks marvelous and very sumptuous. The pictures are perfectly composed. Great job! Thanks Chris! I still have some left over, come over and have some. Thank you Sawsan. It’s hard to keep up with cooking, posting and photographing, especially when you work full time too. I have no time and I don’t even work outside of the house! Nazneen your pictures are always so gorgeous! This looks great! Gorgeous cake! I adore orange citrus in baked goods, and this looks so deliciously moist…I would love a slice with my coffee! Hi Carol! Thank you! Yes, citrus is one of my favourites in baking too and this turned out really moist and flavourful. It smells awesome when baking; it will drive you crazy!